Olivine Sand used in Foundry For Moulding Application. MgO 38% Min - 42% MAX. SiO2 38% Min - 42% MAX. Fe2O3 7 % Min - 9% Max. with the highest magnesium content. Olivine is produced from Dunite rock and has a sandy structure. Blastcleaning, foundry sand, refractories, welding electrodes. The Olivine Sand that we Manufacture, Supply and Export has a unique combination of properties. Much better in comparison to other sands, the Olivine Sand offered by us can be easily recycled, minimizes the production costs and contains high purity Magnesium Iron Ortho Silicate with no free silica. Most olivine is used in metallurgical processes as a slag conditioner. High-magnesium olivine (forsterite) is added to blast furnaces to remove impurities from steel and to form a slag. Olivine has also been used as a refractory material. It is used to make refractory brick and used as a casting sand. With years of experience and knowledge in this domain, we are engaged in offering premium quality Olivine Sand. 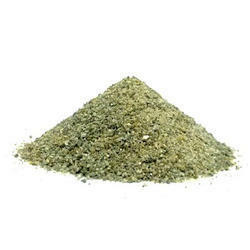 We are one of the most reliable companies in this domain and are into offering Olivine Sand. Muthulaxmi Induatries doing Manufacturing Olivine sand from 2013. We supply quality of products. 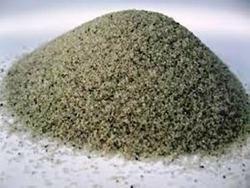 All grades of olivine sand we can supply.